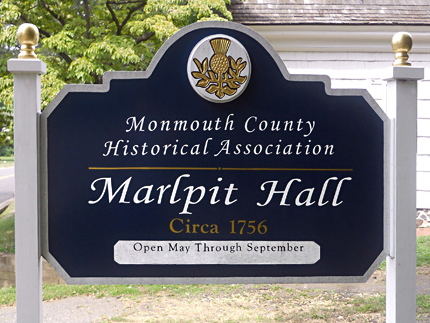 Map / Directions to all Middletown NJ Revolutionary War Sites Open for programs and events. The Murray Farmhouse and Barn are located within Poricy Park. 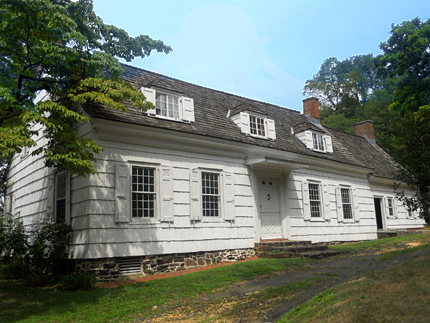 Built circa 1770, it was the home of Joseph Murray, a stonemason who immigrated to New Jersey from Ulster County, Ireland in 1767 with his mother. He married Rebecca Morris, and the couple had four children, three sons and a daughter. 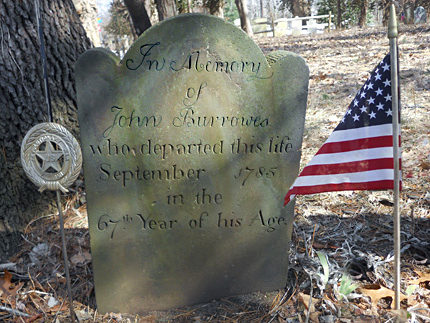 Joseph Murray was strongly pro-Independence, and he began serving in the Monmouth County militia in 1776. 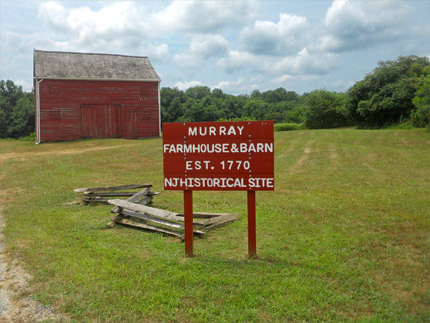 The Murray farmhouse was raided by Tories in 1779, and Joseph was sent to prison. (Tories were Americans who remained loyal to the British in the Revolutionary War.) Upon his release in January 1780, he resumed his militia service. His militia was ordered to commandeer horses, and Murray is believed to have taken one from Marlpit Hall, the home of Edward Taylor, a devout Tory. 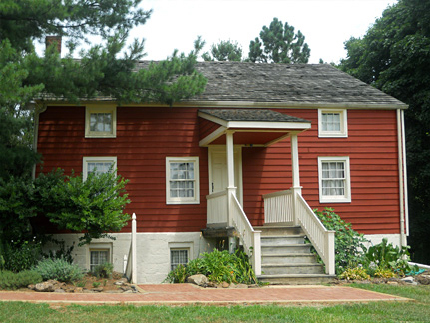 Marlpit Hall is located about three miles from the Murray Farmhouse, and is the subject of the next entry below on this page. There is a small monument in the field where Joseph is believed to have been killed. 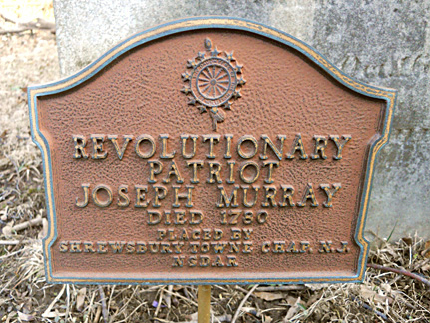 Its plaque reads, "On June 8, 1780 at this site, Joseph Murray was murdered by Tories in retaliation for his daring patriot deeds." A short film, A Visit to The Murray Farmhouse, featuring a tour of the house and barn narrated by two of the house's docents. Taylor remained politically active and continued to serve in the New Jersey Assembly, walking the line of protesting British policies while remaining loyal to the crown. As colonial protests began to turn increasingly radical and revolutionary, with calls for American Independence, Taylor chose ultimately to remain loyal to Britain. When the New Jersey Provincial Congress voted on June 17, 1776 to arrest the royal governor William Franklin, Taylor opposed this revolutionary act. Ten days later, Taylor was one of twenty-six citizens whose arrest was ordered by the New Jersey Provincial Congress because their American patriotism was in question. Over the next several years, he was arrested several more times, and was put under house arrest in Marlpit Hall. For the rest of the war, he continued to live in Marlpit Hall, but his Tory sympathies had cost him the prestige and prominence he once held in the community. At one point, a vigilante group threatened to burn down his house. 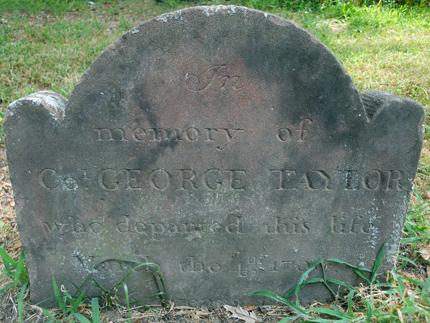 Edward Taylor died January 18, 1783, nine months before the Treaty of Paris officially ended the Revolutionary War. 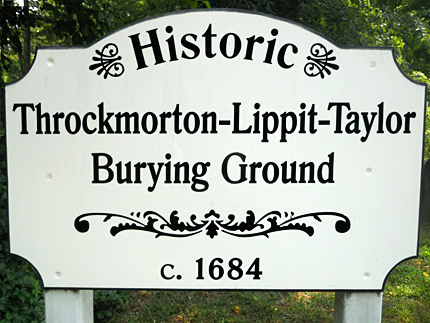 He is buried, along with his wife Mary and son Colonel George Taylor, at the Throckmorton-Lippit-Taylor Burying Ground (See next entry below). 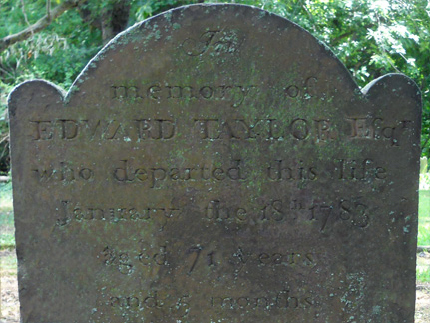 Amongst the old gravestones of the Throckmorton-Lippit-Taylor Burying Ground (circa 1684) are those of Edward Taylor (See Marlpit Hall entry above) and his son Colonel George Taylor, who served in the local militia before choosing to serve with the British army. 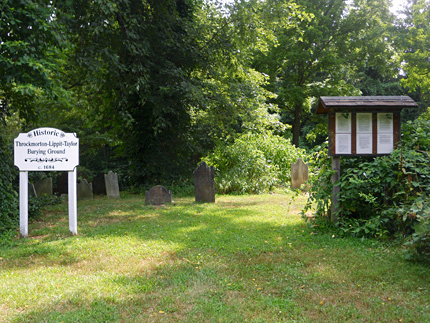 This is also the resting place of some of the earliest settlers of Middletown. Posted on a board at the entrance is a lengthy description of the people buried here. The full text from the board, including a listing of all graves by rows,can be read here. 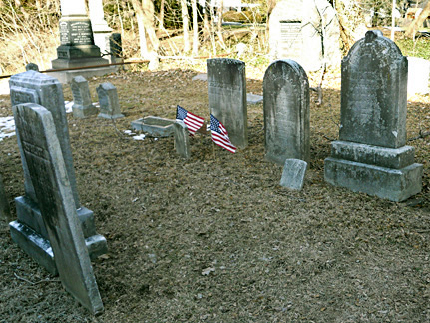 Middletown resident Brian Bugbee earned his Eagle Scout medal for restoration of this burying ground. His year-long project of research and restoration began in November 2001, and he received his Eagle medal in 2003. Click here to read a 2003 newspaper story about Brian's project. • Kings Highway near Normandy Rd. 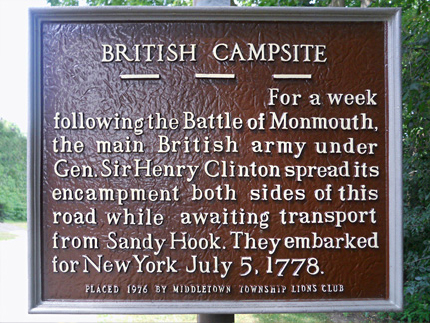 After the Battle of Monmouth, British troops under General Henry Clinton retreated toward Sandy Hook, from where they were transported by ships to British-occupied New York City on July 5, 1778. This series of signs marks the retreat route of the British through Middletown on June 29, 1778, the day after the Battle of Monmouth. It begins on Church Street and then heads east on Kings Highway. Following these signs will lead you to the area which is marked with two different sets of British Campsite signs. • Kings Hwy. near Chapel Hill Rd. • Monmouth Ave. near Portland Rd. • Monmouth Ave. near Locust Point Rd. • Navesink Ave. and Woodhaven Ln. • Navesink Ave. near Pape Dr. 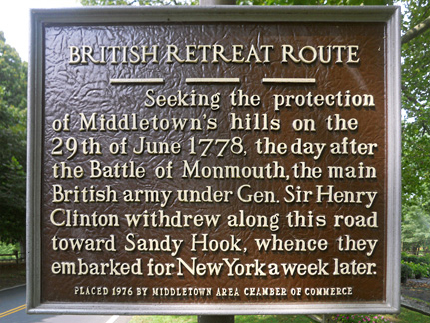 If you follow along the British Retreat Route markers, you will come to a set of signs along Kings Highway, Monmouth Avenue and Navesink Avenue which mark where British troops camped along both sides of the road. They camped here from June 29-July 5, 1778, while waiting for ships to take them from Sandy Hook to New York City. • Chapel Hill Rd. near Comanche Dr.
• Chapel Hill Rd. near Independence Rd. 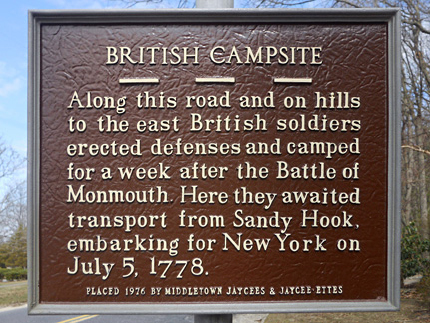 A different set of British Campsite signs runs on Chapel Hill Road, noting that "along this road and on hills to the east British soldiers erected and camped for a week after the Battle of Monmouth." As noted above, the encampment lasted from June 29-July 5, 1778, while the British troops waited for ships to take them from Sandy Hook to New York City. The current church building (1832) is actually the third to stand at this spot since the church was established in 1688. 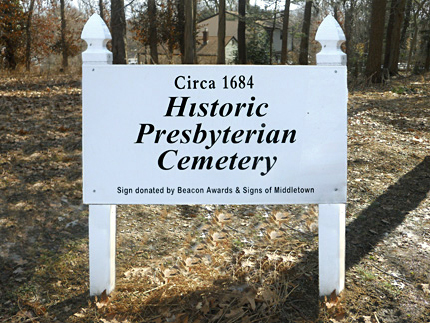 According to the church's historian Elaine Lent, "Earliest historical references to the present church site give vague mention of a significantly earlier 17th Century building which may have originally served as the first Middletown Village meeting house and also as a place of worship. A piece of structural wood from the lowest level of the church has been radiocarbon dated to circa 1635, predating by 53 years the formal organization of the Middletown Baptist Church in 1688. A number of artifacts from the late 1600's have been unearthed beneath the present church sanctuary. The earliest wooden building was destroyed by fire sometime in the early 1700's. The second wooden church structure on the site (circa. 1735-1832) was standing at the time of the American Revolution. Following the destruction of the second wooden church by fire, the present church we see today was constructed in 1832. 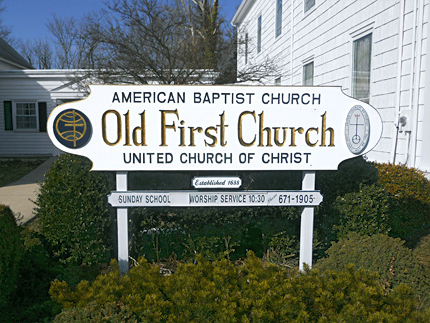 At 325 years of age, Old First Church represents the oldest, continuous Baptist congregation in New Jersey." During the time of the Revolution, the Reverend Abel Morgan of this church was a strong supporter of the American cause, although members of the congregation included both Patriots and Tories. After the June 28, 1778 Battle of Monmouth, when British troops under General Henry Clinton retreated through and encamped in Middletown, they took over the church building, using it either as a barracks or hospital. Reverend Morgan wrote in his sermon notes that he had to preach "at Middletown, in mine own barn, because the enemy had took out all the seats in the meeting-house in town." Two British musketballs and part of a man's leather boot were found during recent excavations, possibly left by British soldiers who occupied the church following the Battle of Monmouth. John Stillwell's grave is located on the side of the church. There is a Revolutionary Soldier marker from the Monmouth Chapter of the D.A.R. at his gravesite, but no stone with his name. Alongside there is a D.A.R. Wife Of A Revolutionary Soldier marker for his wife that also has no gravestone. Kings Highway and Kings Ct.
▸ This article is based on an interview by Millicker with Melissa Jackson, the curator of the Murray Farmhouse. ▸ In the chapter, "I Am Innocent as an Unborn Child" Adelberg provides a detailed and highly readable account of the Revolutionary War experience of Edward Taylor, as well as his son George. Those interested in more detail about Edward Taylor are recommended to Adelberg's book. ▸▸ Adelberg does not list his sources in his book. However, he has published them in a separate document, The American Revolution in Monmouth County: Notes to Accompany the Book and Additional Essay, which he prepared for the Monmouth County Historical Association November 2010. It is available as a PDF on the Monmouth County Historical Association website here. 7. 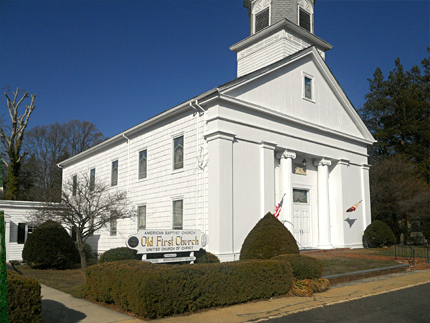 ^ The quote from Old First Church church historian Elaine Lent, and much of the information in this entry, was obtained in telephone and email interviews with I conducted with Elaine on March 17, 20 and 21, 2014. Elaine provided the information about the timeline of church buildings, the Patriot/Tory makeup of the Revolutionary era congregation, the 1990's archeological dig, and the reinterment of Morgan and Murray. I would like to thank Elaine for generously taking the time to speak with me about the history of the church. 8. ^ Names, dates, and military information obtained with the help of the Old First Church church historian Elaine Lent, based on gravestone information and church records. The identification of John Stillwell as the soldier buried at the spot of the unnamed D.A.R. marker was made by Elaine based on the church's cemetery map. 9. ^ Name, date, and military information was drawn from gravestones in the cemetery, and information posted on the board at the entrance to the cemetery.